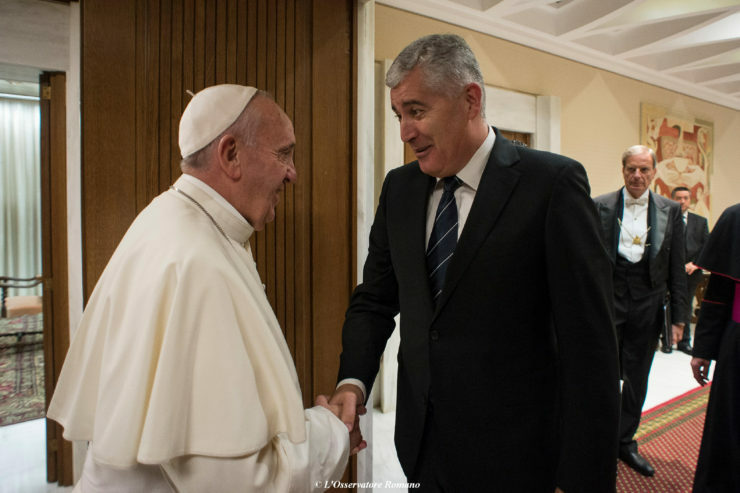 This morning in the Vatican, Pope Francis received in audience Dragan Čović, Croatian member of the Collegial Presidency of Bosnia-Herzegovina. The official subsequently met with Cardinal Secretary of State Pietro Parolin, accompanied by Archbishop Paul Gallagher, Secretary for Relations with States. Since the 1995 Dayton Agreements, which ended the civil war, the Republic of former Yugoslavia is divided into two entities. Each has its own parliament: the Bosniak/Croat Federation of Bosnia and Herzegovina, and the Bosnian Serb-led Republika Srpska. The presidency is made up of three members: one Bosniak, one Croat, and one Serb. The members are elected by popular vote for a four-year term. The member who has the most votes becomes the chairman unless he or she was the incumbent chairman at the time of the election. Every eight months, the chairmanship rotates.